Pesticides tend to be expensive, can be hazardous and are often inefficient at controlling pests. 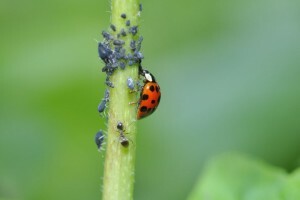 Over time, species can develop resistance to a particular pesticide, but they can also be indiscriminate and kill the enemies of pests that naturally control their populations. In response to this set of challenges, integrated pest management (IPM) was initiated in the 1950s, combining the use of all appropriate techniques of controlling pests that enhance rather than destroy natural controls. If pesticides are part of the programme, they are used sparingly and selectively so as not to interfere with natural enemies, and only as a last resort. IPM takes a judicious approach, using information on pest life cycles and their interaction with the environment to employ the most effective, economical and least environmentally damaging pest control methods. In general, a four-step approach to IPM is advocated. Firstly, action thresholds are set at the point at which infestation by pests requires action. This involves a level of understanding about the size of an infestation and at which point crop damage becomes a problem. Secondly, pests are monitored and identified, to ascertain when levels reach action thresholds and to account for natural enemies. In the third step of prevention, cultural methods such as diversification or planting pest-resistant crop varieties are used as a first line of pest control mindful of effectiveness, cost efficiency and environmental sensitivity. Lastly, control through targeted use of pesticides or mechanical means may be required if pest numbers reach action thresholds and less invasive methods are not working or available. 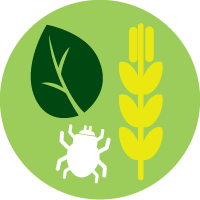 The Food and Agriculture Organisation (FAO) promotes IPM as the preferred approach to crop protection, considering it as a “pillar of both Sustainable Intensification of crop production and pesticide risk reduction”. IPM is a system of farming designed to be sustainable, providing a cost effective, environmentally sound and socially acceptable method of managing diseases, insects, weeds and other pests in agriculture. By relying upon natural enemies rather than the extensive use of inputs such as pesticide, IPM helps to reduce the unwanted environmental impacts from over and improper use, maintaining and encouraging species biodiversity. The reduced reliance upon pesticide also lowers the risk of health hazards to farmers and animals that overuse or misuse can cause. Further, fewer purchases of pesticides reduces a farmers cost of production. Transition from conventional farming to an IPM system may result in short-term yield reductions and income as the benefits of IPM can take a couple of years to show. This is because it takes time for the pests and natural enemies to reach a balance. Once the IPM system is achieved, studies in South Africa have demonstrated an average cost saving of 10% for IPM production due to reduced input costs and higher prices for pesticide-free fruit. However, as crops produced under IPM or other biocontrol methods are not currently marketed separately, it may be unlikely that most farmers will be able to harness this potential economic advantage. U.S. Environmental Protection Agency 2014, Integrated Pest Management (IPM) Principles Available from: < http://www.epa.gov/opp00001/factsheets/ipm.htm> [16 December 2014]. Food and Agricultural Organisation of the United Nations (FAO) 2015, AGP - Integrated Pest Management Available from: < http://www.fao.org/agriculture/crops/thematic-sitemap/theme/pests/ipm/en/> [June 25 2015]. Hattingh, V 1996, ‘Comparison between the cost of an IPM and a chemical approach to pest management’ Citrus Journal, Special Edition, vol. 6, no. 2 pp. 20-28. Urquhart, P 1999, IPM and the Citrus Industry in South Africa. Gatekeeper Series no 86, International Institute for Environment and Development (iied), Cape Town. Nuenz, J 2010, ‘Crop rotation as a method of disease control’ 1 December 2010, Western Farm Press: News Available from: <westernfarmpress.com/management/crop-rotation-method-disease-control> [25 June 2015]. One of the most effective agronomic approaches of Intergrated Pest Management (IPM) is the “push-pull” system, built on the concept of polyculture (agriculture using ‎multiple crops in the same space), that protects maize, millet and sorghum from two devastating pests: the stem borer insect and the Striga weed. Push-pull entails mixing plants that repel insect pests (“push”) and planting diversionary trap plants around a crop perimeter which attract the pests away from the crop (“pull”). 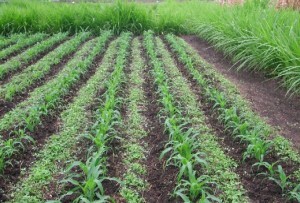 In the case of maize, millet and sorghum, the main cereal crop is intercropped with the forage legume Desmodium. Desmodium emits volatile chemicals that repel stem borer moths (“push”) and attracts a natural enemy of the moths, parasitic wasps (“pull”). In addition, Desmodium secretes chemicals from its roots that cause “suicidal” germination of Striga seeds before they can attach to the maize roots. To ensure further protection, farmers can plant a “trap crop,” such as Pennisetum purpureum (also known as Napier grass) around the edge of the field, which attracts the moths, pulling them away from the main crop. The system was developed in collaboration with the International Centre of Insect Physiology and Ecology (ICIPE) and the Kenyan Agricultural Research Institute (KARI) in Kenya, and Rothamsted Research in the United Kingdom. As of 2010, 25,000 smallholders in East Africa are using push-pull systems. Adopting a push-pull system allows them not only to control pests but also to increase soil fertility, protect against erosion, reduce pesticide use and gain income from marketing Desmodium for animal fodder. In 2014, Greenpeace researchers interviewed three sets of farmers from Kitale and Mbita, Kenya: those practicing push-pull, those using pesticides, and those using neither approach. Although based on only a small number of interviews, average profitability per acre of maize per year was found to be 3 times higher for push-pull farmers than non-push-pull farmers, and this effect was even greater (up to 4 times more profitability) for women. Farmers also reported that maize yields often more than doubled compared to farmers that did not incorporate push-pull practices. In addition, push-pull farmers were also able to reduce their costs of labour and production. Rothamsted Research 2015, Science Stories: Push Pull in Africa, Available from: <http://www.rothamsted.ac.uk/science-stories/push-pull-africa> [25 June 2015]. Hassanali, A, Herren, H, Khan, ZR, Pickett, JA, Woodcock, CM 2008, ‘Integrated pest management: the push-pull approach for controlling insect pests and weeds of cereals, and its potential for other agricultural systems including animal husbandry’ Philosophical Transactions of the Royal Society London, vol. 363, no. 1491, pp. 611-621. Curtis, M 2015, Fostering economic resilience: The financial benefits of ecological farming in Kenya and Malawi, Greenpeace Africa, Johannesburg. Pest management accounts for 25% to 45% of the costs of growing cotton in developing countries. Cotton accounts for nearly 25% of insecticide use worldwide. Cotton pests such as bollworm (Helicoverpa armigera) however can be controlled by biological control, planting pest resistant varieties, cultural control such as deep ploughing and low density planting, the use of pheromones and bio-insecticides and even hand removal. A variety of crops can be intercropped with cotton to help recruit beneficial arthropods and natural enemies. 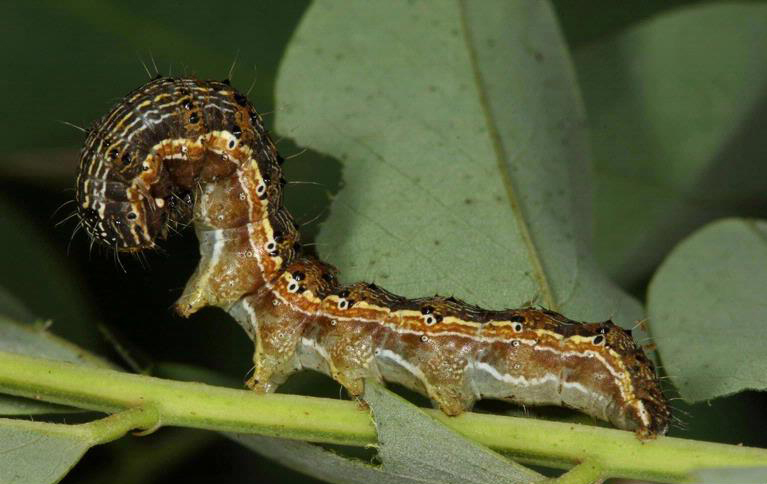 Moths of the African bollworm prefer to lay eggs on crops such as pigeon pea, chickpea, maize, sorghum and sunflower, so these crops can be used as a distraction when planted in strips or around the field to reduce damage on cotton crops. The preference of bollworms to lay their eggs on maize means that it is often used as a ‘trap crop.’ This preference is so strong that in some cases cotton plots remained almost clear of eggs when surrounded by a few rows of maize. Some successful examples can also be found in Asia. On cotton farms in the Xinjiang province of Eastern China, alfalfa has been planted around the field margins of 70,000ha of land. By cutting the alfalfa several times a season, beneficial insects are encouraged to move into the cotton areas, significantly reducing the number of Aphis gossypii, a damaging cotton pest in the region. Similarly in Eastern India, intercropping cotton with lucern, cowpea and groundnut enhanced natural enemy populations, but cotton yields and overall profit of the system varied depending upon which crop was used. For example, cotton performed the worst when intercropped with sorghum and performed the best when planted with groundnut and chilli, highlighting the need to manage trade-offs between integrated pest management (IPM) concerns and system productivity and profitability. International Cotton Advisory Committee (ICAC) (no date), Integrated Pest Management in Cotton Available from <https://www.icac.org/projects/CommonFund/BollWorm/cfc14_05_chapter_2.pdf> [25 June 2015]. Biovision Foundation 2011, ‘African bollworm’ Infonet-Biovision Available from: <http://www.infonet-biovision.org/> [25 June 2015]. Russell, DA & Kranthi, KR 2006, ‘Global status of Insecticide Resistance Mechanisms in the Cotton Bollworm Helicoverpa armigera’ Journal of the Indian Society for Cotton Improvement, pp. 119-128. 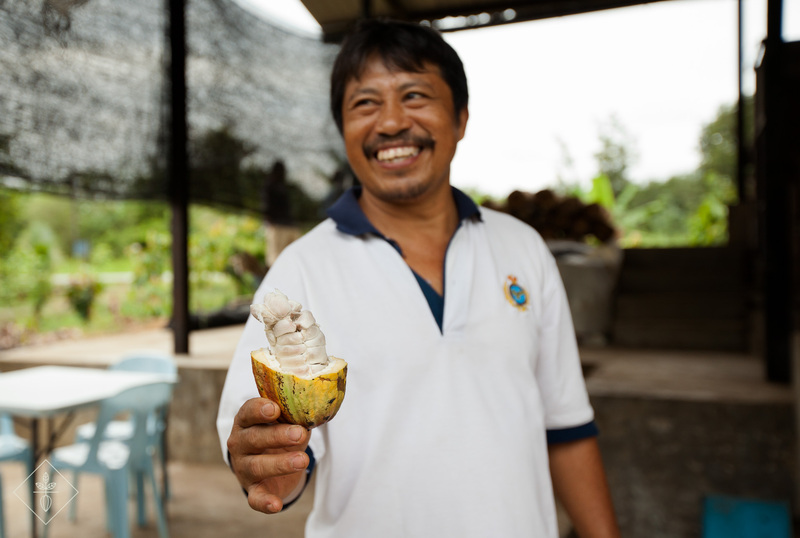 In 1961, cocoa was a recently introduced crop to North Borneo. It was typically grown in large clearings and faced severe damage from pests such as cocoa loopers, bagworms, cossid borers. In addition bee bugs, a pest which was new to science, was damaging the pods. The fields were heavily and repeatedly sprayed with insecticides, sometimes including organo-chlorides such as DDT, but with little intended effect. In their original environments, natural enemies would have controlled these pests, but even those enemies in North Borneo were dying off from the use of pesticides. Recognising that the pesticides were not working, all spraying was stopped and soon after the branch borer and cocoa looper came under control from parasitic wasps. The bagworms were soon controlled by the use of highly selective pesticides, and eventually by a parasitic fly. Destroying a large secondary forest tree, the borer’s host, largely eliminated the rink bark borer population. Within a year, all pests were satisfactorily controlled.